With the latest “Superman” movie, “Man of Steel”, soaring to box-office receipts heights faster than a speeding bullet and hotter than exploding Krypton, the Superman persona has been reinvigorated as a super-hero archetype, role model, ideal boyfriend, savior, and vicarious power-hunger fix for males of all ages. But what about Superman as an employee icon? After all, the caped crusader is also Clark Kent, “mild-mannered reporter” employee with the Daily Planet, valued colleague of Lois Lane and Jimmy Olson, and full-time headache for his boss, Perry White—what with his tendency to suddenly vanish from the job during public emergencies and miss live coverage of the latest Superman heroics. There are various other interpretations of the symbolism of Superman. 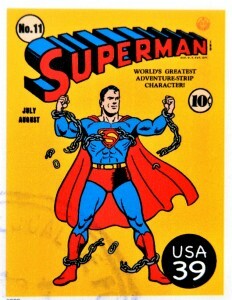 Some recent and fascinating speculation about Superman suggests that his comic book character was explicitly created in 1933 by Jewish Jerry Siegel and Joe Schuster as a Biblical “golem” (an indestructible super-human avenger and protector of the tribes of Israel), or that he is Jesus (in disguise), or serves as an inspiration to illegal immigrants everywhere, because he is one, or is a libertarian champion of the resistance against the New World Order. However, Superman’s significance as an employee icon, paradigm and role model seems to have flown under the radar of pop and work culture, seemingly overlooked, ignored, undetected or disregarded by kids, HR managers and critics alike. 1. Absenteeism will be forgiven if there is a spectacular offset: Despite his exasperating tendency to disappear just as some huge disaster or dramatic rescue is unfolding, Clark Kent’s occasional scoop interviews and reliable pipeline to Superman mitigate the vanishing act—indeed, make the sudden disappearances pale in comparison. This principle is not some pure Hollywood and comic book fiction and fantasy; in fact, it’s a tacit guiding principle of many U.S. elected officials and administrators, e.g., of frequently vacationing presidents and session-skipping members of congress who occasionally endear themselves by supporting something that’s very popular and maybe even right. 2. If you’re doing a job that no one else can or wants to do, it won’t matter that you are an illegal immigrant: Although the Daily Planet did not advertise for Superman, it unwittingly hired him when it hired undocumented Clark Kent. This situation corresponds to U.S. employers unwittingly (or otherwise) hiring undocumented workers or workers with forged employment authorization. As long as they get the job done and nobody else wants or can do it, their visa status will be regarded by some employers as irrelevant. Although not hired to do the job of saving the world from approaching asteroids and fighting for truth, justice and the American (increasingly global) way by battling super-villains with super-powers, these are indeed part of Clark Kent’s secret job description—jobs that no one else is both willing and able to take on. Besides, given that no one else has the privileged access to Superman that Kent has, he does that part of his job in a way no one else can. 4. If you are moonlighting with a second job, keep it to yourself and out of the office: Most of the time, when Clark Kent has to switch jobs and attire to respond to an emergency, he heads to a phone booth (which, given their looming elimination by cell phones, is going to require more time to find). This is an example of excellent compartmentalizing and concealment of second jobs. So, if, for any reason, you need to hold down a second job, it may be wise to be as discreet about it as Superman and to take great pains to ensure you are not caught doing the second job while on duty at the first. 4. Be prepared to perform “emotional labor”: Having to display moods, attitudes and feelings in service to a company, clients or customers constitutes what is called “emotional labor”—basically pretending to feel things you don’t by displaying fake behavior, such as forced customer service smiles and patience. Clark Kent cleverly utilizes emotional labor as a tactic for concealing his Superman identity: No less polite than Superman, Kent is, however, super-meek, even timid and self-effacing. A fast-food franchise counter job would have provided comparable concealment behind non-stop “Have a nice day!” recitations and flash-frozen smiles. However, such emotional labor is not as a requirement limited to basic service industries. Ask any hedge-fund manager with top-tier clients, any doctor with decent bedside manner or a used-car salesman—they know. 5. Tailor your resume to the job and omit anything you don’t want to discuss in the job interview: Do you imagine that Clark Kent would have listed “caped super-hero” or “kryptonite researcher” among his credentials noted in his resume? Of course not—not even under “interests”, “hobbies” or “volunteer work”. Likewise, if you have had jobs you can’t afford to list in your resume, don’t. Just hide them. If that’s a choice that is ethical enough for Superman, it should be ethical enough for you. 6. Always have a change of clothes with you in the office: Like Clark Kent, you may have to unexpectedly change into something else in an emergency or after a coffee spill, or have something on hand to change into for a vigorous physical workout, e.g., at the company gym or in, Kent’s case, holding up the Golden Gate bridge after a collapse of sections of it. In fact, many of us will have as many reasons as, if not more than, Clark Kent for doing so, since being as clumsy as he pretends to be or having clothing that, unlike his second suit, can be stained or torn will be true for virtually all of us mere mortals. As a corollary to this advice, if there is anything you never change that you are wearing under your business suit every day, make it your little secret.